Before I start I should point out that Jack Vance is one of my favourite authors, with his novels The Blue World and Night Lamp counted among my favourites. I love the way he wrote – the formal yet flowery language, the fabulous descriptive work and exotic cultures – so I was very excited to receive Hard-Luck Diggings. 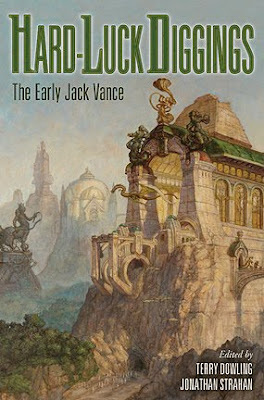 This is a collection of early Jack Vance stories from the 40s and 50s presented chronologically. I don’t recall ever having read any of his short stories before, so I was interested to see what editors Terry Dowling and Jonathan Strahan had put together. I had high hopes for the book, which always leads to the worry that I might be let down.